We launched public profiles on Dopplr yesterday – and the thing that seems to get people talking is their personal velocity, rendered as an animal. I’m not sure when this occured to me, perhaps it’s my fascination with daemons and familiars – but it seems to strike a chord. The hardest part of implementing this was finding enough animals at lower speeds – the internet has lots of data on fast, exciting beasties, but not so much on the slowpokes. If you’re a zoologist or know one please get in touch! Alien that gives severe haircuts, originally uploaded by blackbeltjones. 21062008260, originally uploaded by antimega. I’m far too old and creaky for it now, but as long-time readers will know I still have a fondness for those who skate the city. 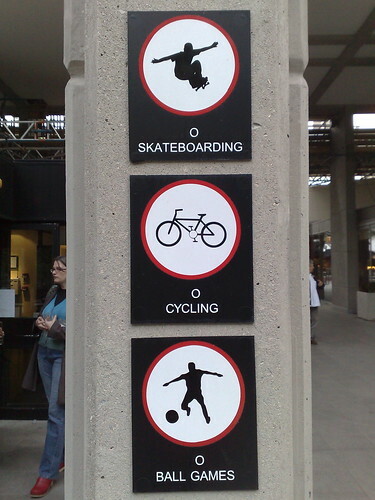 This sign – captured by Chris, adapted liberally by another – is at the Brunswick Centre in London. What kind of society are we likely to get if it turns out that yes, we’re hitting peak oil round about now, but that it’s possible to process random junk biomass into crude oil for $100 a barrel, and $1000 will buy you a machine that you plug into your laptop and that can make, well, just about any small macroscopic structure you can design, out of feedstock derived from biosynthetic crude oil or woodchips, or paper? Fortune500 companies would be better off hiring science-fiction writers than MBA consultants right now. At the end of last year I had the pleasure of working on a project with the first and second year Design Interaction students at the RCA. It was sponsored by Intel’s People and Practices Group, extending and examining their work on the future of money. RFID force-feedback transactions from chriswoebken on Vimeo. Core77’s already written about it, and I’m hoping to see some some of the pieces in the RCA Final Show shortly. Congratulations to all there on the work so far, and good luck for the final push!